Trenchless sewer replacement saves your money, your lawn, & your time. Blockages in your home’s sewer lines can lead to expensive and destructive excavation of pipes that can end up costing you thousands of dollars. 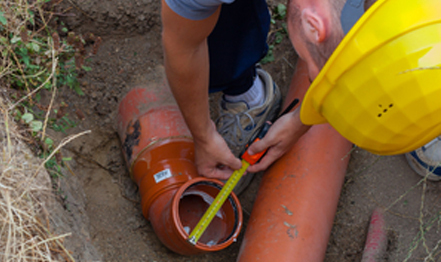 We offer trenchless pipe replacement that can repair your collapsed, broken, or punctured sewer lines without having to dig up your entire property. There are two methods of trenchless pipe replacement: PIPE BURSTING and PIPE LINING. Pipe bursting allows our plumbing professionals to dig two small points of access at the beginning and end of your piping system instead of digging up your entire yard. The old line is blown apart as a new pipe is pulled through it, effectively destroying the damaged line and replacing it with a high density polyethylene pipe. With pipe lining, a felt impregnated fiberglass sleeve is placed inside the faulty pipe to seal off any damaged areas, creating a structural repair. Access is usually made through one entry point and the new lining can be installed all the way to the city connection, even under a street or driveway. Our trenchless sewer replacement technology has saved our customers thousands of dollars and valuable time by avoiding a massive excavation of their property.